I read with a lot of interest the latest cover story on data visualizations by Danielle Albers Szafir, particularly since I recently gave an introductory seminar on this topic to Ph.D. students attending the Bioinformatics Summer School at the European Bioinformatics Institute (EMBL-EBI). Mentioned (even in passing) the importance of studying “what people do” (which has been fairly firmly established within the UX and HCI communities). The cover story focuses on “understanding what people see when they look at a visualization” to design visualizations “that support more accurate data analysis and avoid unnecessary biases.” This is very valuable, particularly within the context of a “how to” article which needs to be brief and practically applicable. Nonetheless, I think that it would have been useful to mention the hierarchy of visual channels (see Cleveland & McGill 1985, Mackinlay 1986, Heer & Bostock 2010) especially given that position is considered to be an even better way to encode quantitative data than sequential or divergent color maps. Figure 2 in the recent review by O'Donoghue et al. (2018) provides an excellent visual overview of the hierarchy combined with succinct practical advice on the use of color maps. Additionally, given that the article is about "graphical integrity," I was expecting it to refer to Edward Tufte, to whom this principle is attributed. I was also a bit surprised not to see a reference to Tamara Munzner's textbook for those who are new to the field but want to study interactive visualizations in more depth. My own audience is early career life scientists so I based my seminar on the Points of View columns on data visualization in Nature Methods, which is a familiar and inspirational journal for them. Given that some of the examples in the cover story came from biology, citing this resource may have been useful too for that readership. In my role as a UX practitioner, I rely on particular methods to understand the needs of life scientists (such as interviews and contextual observations), to capture these needs (typically as user personas and task models) and to formulate the question that we are trying to answer with a visualization (for example, as a problem statement or a job to be done). In other words, I focus as much on “what people do” as on “what people see,” by applying methods that are fairly firmly established within the HCI and UX communities. When I tell the story of how we designed a visualization or a whole web application for a particular service in EMBL-EBI, these methods stand center stage. Although the importance of qualitative field work and analysis has been highlighted, for example, in Munzner’s design study methodology framework, my impression is that these popular UX methods are still not routinely embedded in the everyday process of data visualization researchers and practitioners. The emphasis on “what people see” in the cover story reinforced this impression. At EMBL-EBI we bring together experts from industry and academia to address current challenges in data visualization faced by our industry partners in an attempt to bridge the gap between data visualisation researchers, the HCI community, UX practitioners, and domain experts (especially from the pharmaceutical and agro-food industry). In closing, I’d like to thank Danielle Albers Szafir for writing the cover story and the editors of Interactions for publishing it. I welcome your feedback on these thoughts. 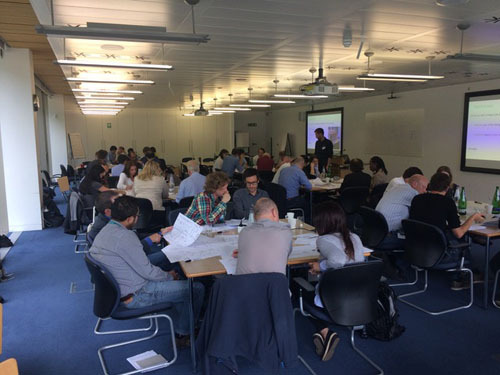 As a Senior User Experience Designer at EMBL-EBI, I enjoy spending time with life scientists, developers and other stakeholders and helping them work together to achieve their goals using Lean User Experience methods.